It’s that time of year to sit down to make fun of the guy at the office holiday party who gets too drunk and starts hitting on coworkers prop up the economy by spending excessive money on gifts stunt our children’s logical development by telling them a fat man squeezes down every chimney in the world in one night to deliver presents contemplate the role of religion in our society! To that end, here is a religiously-themed SCOTUS oral argument transcript figuratively gift wrapped just for you. Can town councils start their meetings with Christian prayers? That is the question before the U.S. Supreme Court in Town of Greece v. Galloway. The small town of Greece, NY begins town council meetings with a prayer, which is almost always Christian in nature. Two citizens of Greece, an atheist and a Jew, attended a meeting to request that changes be made to a local television channel. Offended by the prayer at the start of the meeting, these citizens sued the town arguing that the prayer violates the Establishment Clause of the Constitution, which codified the separation of church and state. Below is the actual transcript (lightly edited for clarity) of the citizens’ attorney’s oral argument (with my thoughts intermixed in italics) at the Supreme Court last month. The full official transcript can be found here. Mr. Laycock,the citizens’ attorney, begins by trying to explain to the Justices that the town council meetings in Greece begin with a prayer as part of the meeting, so people who want to attend are essentially forced to listen to the prayer. Mr. Laycock believes that any prayer should be held well before the meeting itself, so people who don’t want to hear it can show up after the prayer without missing the meeting. Mr. Laycock would also like the prayer to “avoid points on which believers are known to disagree.” Now, how exactly someone is supposed to pray in a way that appeals to everyone is beyond me, but as we will see, Mr. Laycock sure seems to think it’s possible, so let’s hear him out. MR. LAYCOCK: Mr. Chief Justice, and may it please the Court. There is no separation in time between the public hearing and the invocation. People appear before this town board to ask for personal and specific things. Our clients put shows on the cable channel. They were concerned the cable channel was about to be abolished or made much less usable. People appear to ask for a group home — There are many personal petitions presented in the immediate wake of the prayer. JUSTICE ALITO: But that’s during the public forum part. MR. LAYCOCK: That’s in the public forum. JUSTICE ALITO: Which is not the same thing as the hearing. MR. LAYCOCK: It’s not the same thing as the hearing and that’s the point, Your Honor. JUSTICE ALITO: There’s another part of the proceeding that is the hearing. If you have no idea what Alito is trying to get at, good, neither do I. Hang in there. JUSTICE ALITO: And that’s when somebody has a specific proposal. They want to — something specifically before the board and they want relief. They want a variance. MR. LAYCOCK: The hearing is a particular kind of proposal. JUSTICE ALITO: And that is separated in time. MR. LAYCOCK: That is somewhat separated in time. The forum is not. And people make quite personal proposals there. They ask for board action. They often get board action. JUSTICE ALITO: But that is a legislative body at that point. It’s clearly a legislative body, is it not? The only difference is it’s a town rather than Congress or a State legislature where you have more formalized procedures. This is more direct democracy. Or it’s a town meeting. MR. LAYCOCK: It is direct democracy. When a citizen appears and says, solve the traffic problem at my corner, solve this nuisance family that commits a lot of crimes in my block, that’s not asking for legislation or policymaking. That’s asking for administrative action. This board has legislative, administrative, and executive functions. JUSTICE ALITO: Well, if that is your argument, then you are really saying you can never have prayer at a town meeting. JUSTICE ALITO: How could you do it? Because that’s the kind of thing that always comes up at town meetings. Wait a minute. I see what Alito is doing here. On rare occasions, a single Justice will ask at least ten questions in a row. We call it a DDQ, and it’s such a rare accomplishment that it can be a career defining moment for a Justice. We’re already at eight questions in a row for Alito. YOU CAN DO IT! JUSTICE ALITO: All right. Give me an example. Give me an example of a prayer that would be acceptable to Christians, Jews, Muslims, Buddhists, Hindus. Give me an example of a prayer. Wiccans, Baha’i. CHIEF JUSTICE ROBERTS: And atheists. Ohhhhhhhhhh. Alito made it to nine before being cut off by the Chief Justice. That’s like taking a perfect game into the ninth inning only to lose it on a bunt single. JUSTICE SCALIA: And atheists. Throw in atheists, too. First of all, the Justices seem to think that there is something humorous about atheists throughout this transcript. I can’t figure out what it is. Second, Roberts clearly beat Scalia to the punch on bringing up atheists, so he should arguably get at least partial credit for that laughter line. Whoa. Hold on. Let’s back up here. Mr. Laycock is basically arguing that government-sponsored prayer is okay as long as it has a broad appeal. That’s not an unreasonable argument, but look how he makes it. He first refers to “the American context.” Personally, when I think of the American religious context, I think first of freedom to worship as one chooses and second of a broad embrace of diverse religious, cultural and traditional backgrounds. But Mr. Laycock apparently has something very different in mind. He throws in the term “the American civil religion” as if it is a synonym to “the American context.” There is an American civil religion? Finally, as another synonym, Mr. Laycock throws in “the Judeo-Christian tradition.” So, when Mr. Laycock refers to “the American religious context,” he’s apparently talking about Christians and Jews, which together constitute about 80% of Americans. But it is that other 20% that need the protection of the Establishment Clause. I think Mr. Laycock’s position here is difficult to defend. He’s asking the Court to draw a line somewhere between beliefs, and the implication is that everyone on the wrong side of the line is somehow less American and less deserving of First Amendment protection than everyone else. JUSTICE ALITO: Give me an example then. I think the point about atheists is a good point. But exclude them for present purposes and give me an example of a prayer that is acceptable to all of the groups that I mentioned. MR. LAYCOCK: About a third of the prayers in this record, Your Honor, are acceptable. JUSTICE ALITO: Give me an example. MR. LAYCOCK: Can I have the joint appendix? The prayers to the almighty, prayers to the creator. JUSTICE ALITO: So if a particular religion believes in more than one god, that’s acceptable to them? MR. LAYCOCK: Well, some religions that believe in more than one god believe that all their many gods are manifestations of the one god. But the true polytheists I think are also excluded from the McCreary dissent. JUSTICE SCALIA: What about devil worshippers? Is it just me or are we listening to a group of elites laughingly, systematically exclude religious minorities from protection under the Establishment Clause? CHIEF JUSTICE ROBERTS: Who is going to make this determination? Is it an ex ante determination? You have to review the proposed prayer? Just let the example question go, Mr. Laycock. It’s over. The Chief Justice already asked a new question. You’re going to get yourself into trouble. See? Just let it go. MR. LAYCOCK: But there are — the count was about, about two-thirds, one-third. So there are plenty of them in here. JUSTICE ALITO: 74a, “Heavenly father,” that’s acceptable to all religions? MR. LAYCOCK: “Heavenly Father” is very broadly acceptable. And you know, the test cannot be unanimity, because that’s impossible, right? That’s why the atheists are excluded. I’m sorry, Justice Scalia; would you repeat your question? They don’t look THAT much alike. 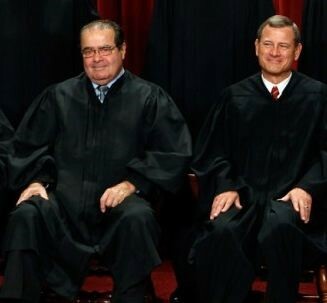 CHIEF JUSTICE ROBERTS: Well, I’ll repeat mine. It was: Who was supposed to make these determinations? Is there supposed to be an officer of the town council that will review? Do prayers have to be reviewed for his approval in advance? CHIEF JUSTICE ROBERTS: So there is an official in the town council that is to instruct clergy about what kind of prayer they can say? MR. LAYCOCK: That’s right. State legislative bodies, the House of Representatives have these kinds of guidelines. They issue them to the guest clergy before they appear. JUSTICE KENNEDY: And if I’m that official and I think a prayer was over the top for being proselytizing and particularly sectarian, I would say I rather you not come back next week; I am going to look for somebody else? It really seems to me that Mr. Laycock’s argument is weak. The First Amendment is meant to protect the rights of minorities and the disenfranchised. But Mr. Laycock wants a combination of the government and the clergy determining what prayers are okay at town meetings? That kind of sounds like the opposite of what the Constitution requires. JUSTICE KENNEDY: Well, so in other words the government is now editing the content of prayers? MR. LAYCOCK: Editing the content of government-sponsored prayers. Of course these clergy can pray any way they want on their own time with their own audience. But this is an official government event. And it’s part of the board’s meeting. It’s sponsored by the government. And they delegate the task to these clergy and they can define the scope of that. That is a very good argument. But here’s the problem: it’s a 4-yard dive on 4th and 10. It works, but it doesn’t matter because you’re still six yards short of the first down. Mr. Laycock is trying to convince SCOTUS that the government must instruct the clergy to limit prayers to broadly accepted messages. The argument Mr. Laycock just made stands for the proposition that the government MAY instruct the clergy on the content of prayers at governmental functions. That may be true, but it doesn’t follow that the government MUST instruct the clergy to limit prayers to certain messages. What if the government wants an extremely Christian prayer? That’s the real question in this case. Does the Constitution FORCE the government to limit prayers to certain content? For the answer to that question and more of our Christmas holiday SCOTUS transcript extravaganza, here is Part 2. Yes, that is his real name. Let’s be mature here, people. And here is some additional background information on the case. By the way, this is MTTC’s 100th post. Thank you everyone for all of your comments, emails and tweets. Double Digit Question. As always, I would be humble enough to admit when someone comes up with a better name than me. So feel free to comment, email or tweet other possibilities for this. And props to Judy, who recommended using “tussled off” to denote the start of a new SCOTUS term. This entry was posted in law, religion, supreme court and tagged legislative prayer, oral argument transcript, SCOTUS. Bookmark the permalink.